We provide empirical analyses hinting towards time dependence of the rate at which buy and sell market orders arrive in the intraday power market for hourly deliveries in Germany. We then study how optimal intraday trading is impacted by this time dependence. The results may be particularly useful for automated trading in the market under consideration. Commodity-linked positions often exhibit a combined exposure to both market prices and nontradable terms (e.g., harvest, volume, load). We provide a general theory of customized contract design aimed at optimally hedging the corresponding joint risk. Tailored hedges are derivatives written on the underlying tradable and any quoted variable exhibiting statistical dependence on the quantity term. Given agent's beliefs, mean-variance preferences, and a copula-based setting, we derive analytical solution sought among two-asset contingent claims and numerical solutions for portfolios of one-asset customized hedges. Closed-form solution are computed under separable copula densities. In recent years, the price spread between the major crude oil classifications Western Texas Intermediate (WTI) and North Sea Brent reached unprecedented highs and several surprising crossovers. After a long period of a fairly constant price gap around $2, the WTI-Brent spread decoupled since 2008 and peaked at -$29.59 per barrel in late September 2011. Using autoregressive distributed lag regression and a daily data set for the period between 1995 and 2014, we analyze various supply and demand factors as drivers of the price differential between WTI and Brent. Our results reveal that the convenience yield, as proxy for crude oil inventories, is the most important spread determinant. Unlike other papers, we find that the impact of the convenience yield even increased after 2008. Moreover, there is evidence that the balancing mechanism between both crudes changed over time and paper markets became more important than physical markets for equalizing price differentials. To analyse whether the financialization of commodity markets contributes to systemic risk, we study a system consisting of both commodity and financial futures markets in a sparse Vector AutoRegression (VAR) framework. It allows us to distinguish two components of systemic risk: we can assess systematic risk (integration) and propagation risk. This work aims at providing (non exhaustive) tools to help regulators analyse and monitor markets, with a focus on systemic risk. In particular, we can identify which markets are influential in any component of systemic risk and thus conduct a more in-depth investigation if necessary. We rely on an algorithm that gives sparsity in both the autoregression and partial correlation matrices. In a static analysis, in the spatial dimension, we find that sectors are separated, except for metals and finance. We also show that including the maturity dimensions is necessary, since they connect all the sectors and thus cause the integration of the whole system. In our dynamic analysis, we focus on major financial events (the beginning of the subprime crisis, the default of Lehman Brothers, the maximum and minimum returns of the S&P500 futures and the 2010-05-06 S&P500 e-mini Flash Crash). We find that integration is very high between commodities and financial assets and among commodities, making systematic shocks a realistic possibility around each of these events, but that there is little daily propagation (slightly more around the Flash Crash). We propose and investigate a market model for power prices, including most basic features exhibited by previous models and taking into account self-exciting properties. The model proposed extends Hawkes-type models by introducing a two-fold integral representation property. A Random Field approach was already exploited by Barndor-Nielsen et al., who adopted the Ambit Field framework for describing the power price dynamics. The novelty contained in our approach consists in combining the basic features of both Branching Processes and Random Fields in order to get a realistic and parsimonious model setting. We shall provide some closed-form evaluation formulae for forward contracts. We discuss the risk premium behavior, by pointing out that in the present framework, a very realistic description arises. We enrich our analysis with a statistical study. We illustrate by graphical representation the main achievements of this approach. Joint work with Ying Jiao, Chunhua Ma and Carlo Sgarra. 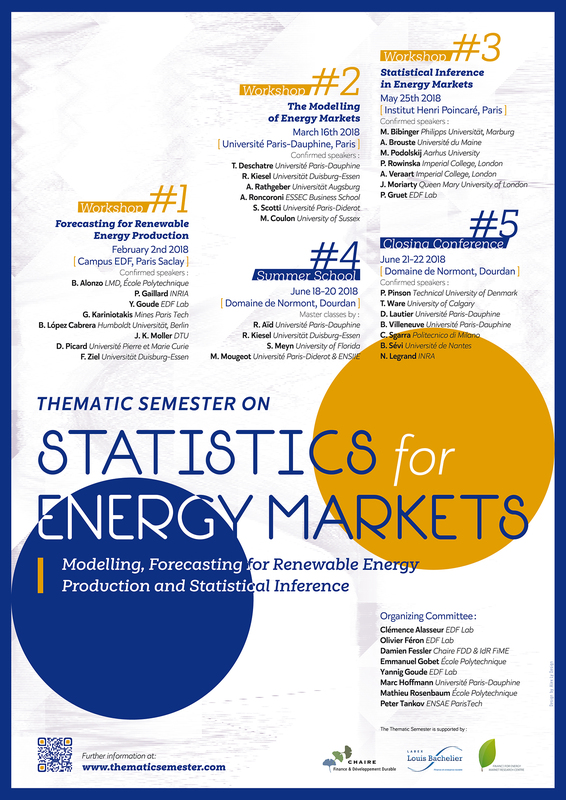 Rapidly-changing energy markets over recent years have led to important modeling challenges along with numerous opportunities to apply and extend techniques from statistics and mathematical finance. The literature in the area has grown significantly, with much interest in price or demand models, derivative pricing or hedging techniques, and optimal investment or operational decisions. After a brief overview of electricity market challenges and modeling frameworks, we focus particularly on the role of supply and demand variables and the use of structural models. We present a complex structural model adapted to several key challenges of the German power market, in the face of a very diverse fuel mix, demand-side price elasticity in bid data, and rapidly growing penetration of renewable generators. In particular, combining several separate model components and some approximation techniques, we propose a practical approach to the important problem of constructing high granularity forward curves calibrated to limited available market data. We also mention possible extensions to the case of multiple coupled European markets, an ongoing and crucial challenge for all classical price modeling techniques. In a first part, we consider a doubly stochastic Poisson process with stochastic intensity function of a continuous semimartingale. An estimation procedure is proposed in a non parametrical setting for this function using a local polynomial estimator. We give a method to select the bandwidth in a non asymptotic framework, leading to an oracle inequality. A parametrical test is also proposed to test if the function belongs to some parametrical family. In a second part, our results are used to model the dependence between electricity spot prices spikes and the wind penetration index in the European energy market. The wind penetration index is given by the ratio of the wind energy production divided by the total electricity production. We find that the wind penetration has an impact on the intensity of the spike occurrences in the electricity prices, and we formulate a joint model for electricity prices and wind penetration and calibrate it to recent data. We then use the new joint model in an application where we assess the impact of the modeling assumptions on the potential income of an electricity distributor who buys electricity from a wind farm operator.